We are entering into the last and the fourth week of the full month Blogging Marathon. We had decided on four different themes for each week, and somehow the fourth week ended up being Crafts and arts, mostly related to food is what we all assumed and presumed. Anyway all for the artist that I am, I can hardly get myself interested to certain things. Whether I can actually do it or not is the point, I don’t have interest. Anyway that allowed me enough space to breathe and feel happy that I can actually plan something decant and not think I must throw up idea that a 4 year old might not want to even check out. In the process, I decided that the best I could do, given the situation, was a condiment theme. Now the bad rush was to take fancy pictures of all the condiment that I had to prepare in the process of making the previous posts. Can you imagine the funny state, I shared the main recipe, left out all the chutneys and other sides. Imagine if at all somebody actually wanted to make the recipe, they must be wondering I am gone nuts! Anyway I would’ve been very happy had somebody actually asked me, well till now none did, so here I am finally presenting the sides that made those other dishes so complete and delicious. So for the next seven days you will be reading about the condiments that I had prepared during the marathon. 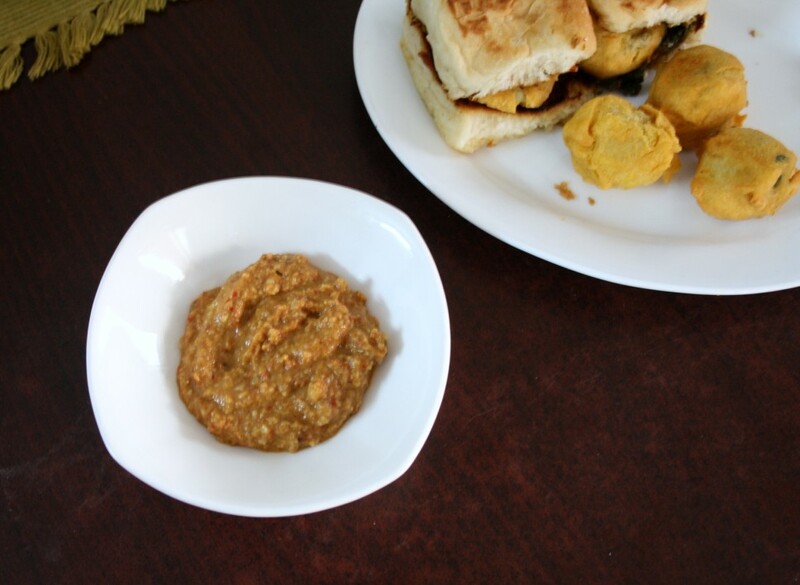 First in the series is the Peanut Garlic Chutney that makes up the delicious Vada Pav. I will leave the marathi pronunciation to yourself. Please feel free to practise it as many times as you want. I have given up! Roast the coconut on a low fire till it begins to turn golden. 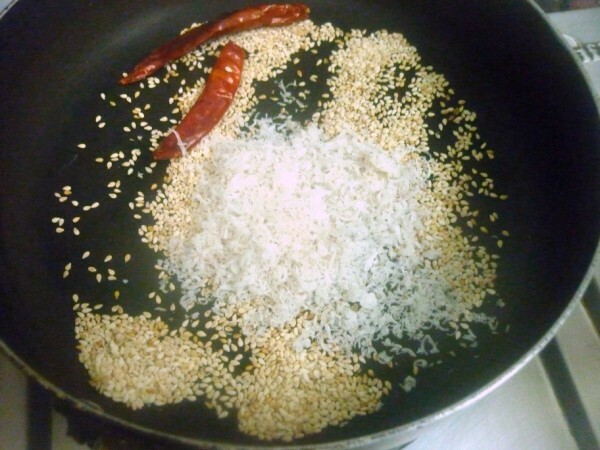 Roast the sesame seeds in the same way. 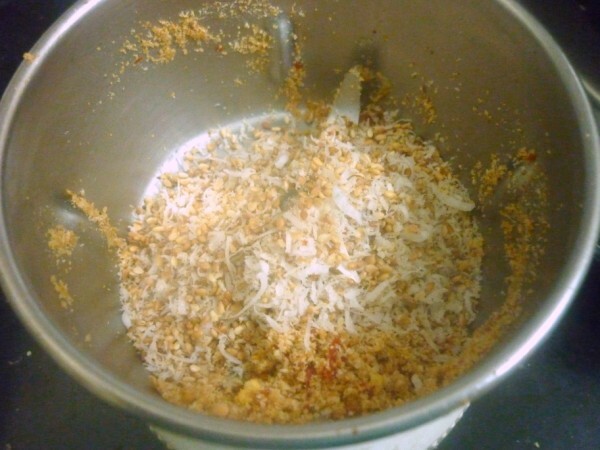 Mix all the ingredients except the peanuts together and grind in a food processor. 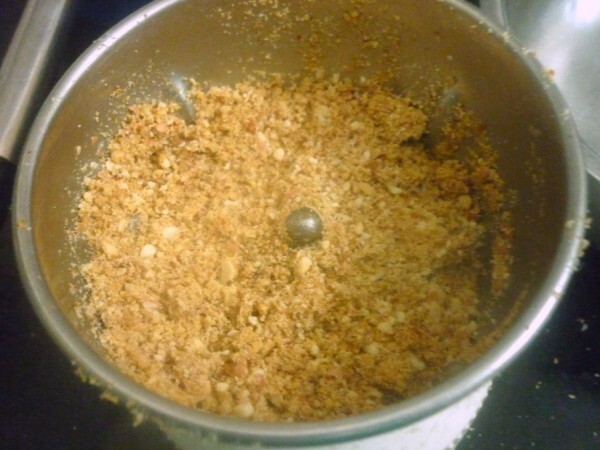 When done add the peanuts and mix well. Season with salt. 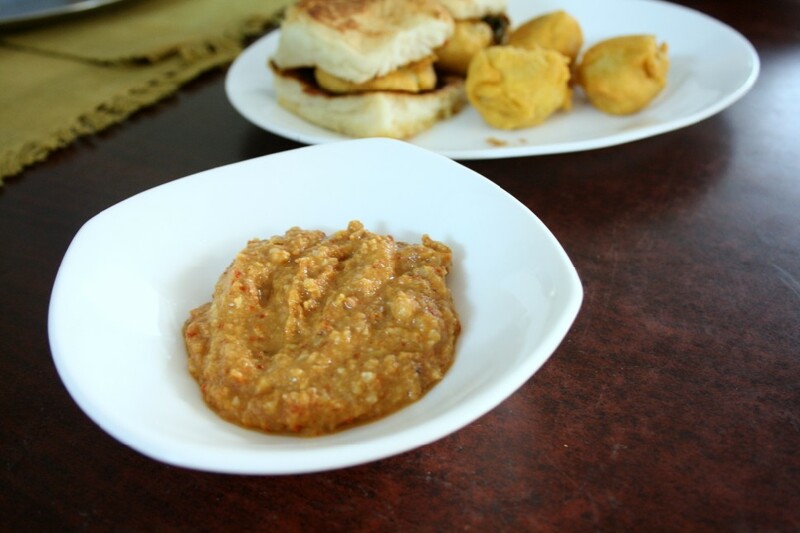 This dry chutney can actually go very well with rice as well. When I used in Vada Pav, I increased the spice level by add chili flakes directly on the tawa and roasted the buns as I saw the cooks doing it in Ahmadabad. It was so delicious in fact. How I wish I can eat this chutney now. Vada pav I miss u.
I wish I had taken up the offer on misc too! That is a nice recipe Valli. Wow. I can go back to that afternoon when we had this and cholafali in Ahd. It was all so yum. Your kids have really had a treat this entire April month Valli! my mouth is watering..thinking of the vada pav with this chutney. What an amazing chutney.. I love anything with peanuts and sesame seeds.. I use to do same way, except sesame seeds. My two brothers and my mom are artistically talented (one draws well and the other used to make all sorts of things – like curtains with straw, ribbon feathers, rose from clothes and a of stuff). I have never ever been interested in this area, unfortunately. So you can imagine my horror at having to do 7 days of Craft! There was no way I could do it…no talent and more importantly, no interest..
Never tried mixing peanuts and sesame in chutneys. It sounds interesting.